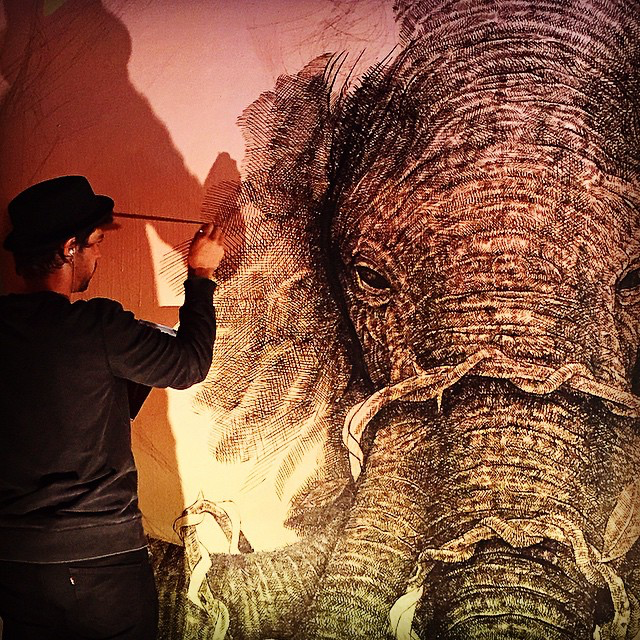 The artist who is known for his chimerical and dreamlike depictions of animals in a state of metamorphosis, has giant murals in various cities across the globe. A lot of patience has worked for Diaz and the result are meticulous compositions that look like perfect pen-and-ink drawings. 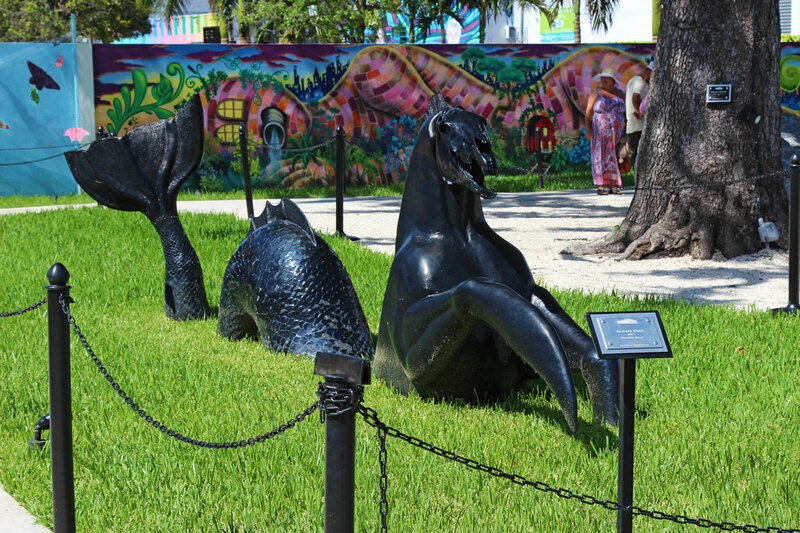 Puerto Rican artist Alexis Diaz has three major pieces in Wynwood – a mural in the main courtyard of an elephant octopus mashup; a mural of skulls on NW Second Ave outside Wood Tavern; and a creepy cool sculpture – his first – gliding through the courtyard like a steampunk Loch Ness Monster. Hailing from Puerto Rico, Diaz has been drawing from a very young age but street art always called to him because, as he says: “I felt that traditional, paint-on-canvas style had its limitations – I had always dreamed of creating art for all people to enjoy”. After attending Escuela Central de Artes Visuales, Diaz went on to collaborate with the well-renowned artist collective known as La Pandilla (The Gang). Seeking ways to express himself and the dreamlike visions he had in his head, Diaz turned to mural art and began creating his works in public spaces, to reach out to a broad audience for the people in the streets. Using a small brush and a lot of patience, Diaz uses a hash mark style of scratchy lines similar to vintage illustrations. He creates these meticulous compositions freehand, line-by-line as he goes along. The subject is always important to both La Pandilla duo and Diaz, as he creates combinations of animals according to the ecosystem of the place he is working. He uses local stories, feelings, his imagination and also evolution and impulses of the times to create a personalized response to wherever he is. He hasn’t been at the game long, starting out in 2010, alongside his friend Juan Fernandez aka JUFE. Both artists are known for intricate line detail, streaks pulsating with vibrant color and the melding of fantastical animal imagery. The street art scene in Puerto Rico was very limited in 2010, only using typical spray cans. When he discovered artworks by Keith Haring it became a major inspiration and encouraged him to step outside aerosol and begin to paint the street using other means. Looking back, Alexis still is amazed how art changed his life. “I quit my job and everything I was doing at the moment and for a year and a half I painted the streets of Puerto Rico without gaining a penny,” he remembers. Now less than ten years later over 40 of his surreal murals can be found in more than two-dozen cities worldwide. And he keeps adding to the list: “I’ll be painting in New York, Budapest, Cozumel, Rome, Berlin, San Diego, Denver, Paris, and Sydney,” he says. As a major muralist, artists have to have a singular style. Diaz’s unmistakable technique uses thousands of tiny black brushstrokes to create unearthly murals. His work features fantastical and dreamlike depictions of animals in various states of metamorphosis. 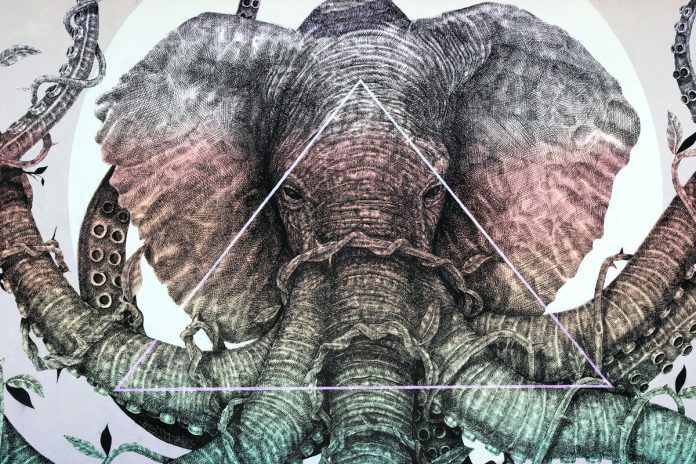 The animals fluidly morph into one another creating new species, such as the elephant with octopus tentacles called an Octophant as seen in his mural in the Wynwood Doors for Wynwood Walls’ 2014 program, the Art of Collaboration. The incredible depth and texture his brushstrokes create give a 3-D quality to his work with glowing colors of green and pink and orange to heighten the unreality. He had previously created an Octophant in Shoreditch, London. Diaz designed his first sculpture titled Hipocampo, created for Wynwood Walls during the Art Basel Miami 2015. His refined and meticulous aesthetic created hybrid cross of a horses skull and torso with crab claws for hooves and an undulating body with scales and fins and a giant flipper tail slithering through its own exuberant world. He has previously painted colorful murals of this creature, but for the sculpture he has painted it a gleaming inky black. The third work of art he has in Wynwood is outside the Wood Tavern, a restaurant/art project bar and restaurant on NW Second Ave and 25th Street. It’s a striking image of 2 skulls merged together so that there are three eye sockets instead of four. Surrounding the skulls are squawking ravens with sky of stars, a moon and a sun above. The effect is that of a giant tarot card. What is the fortune? What does it mean? Can we ever know? Quoth the raven, nevermore. His giant murals now cover everywhere from the side of a crumbling building in Bratislava, Slovakia to a makeshift billboard in the middle of the Arizona desert. Both Diaz’s solo work and that of La Pandilla demonstrate a deep interest in transfiguration; animals morph into one another, human hands and skulls become wings and claws and shells and creatures are transformed into ships and submarines to be used for the transport of other animal subjects. Apart from numerous murals left by his hand on the walls of Puerto Rico, Diaz brought street art to the city of San Juan on a whole new level when he co-organized an international urban art festival called Los Muros Hablan (translated as The Walls Speak), the first of its kind in Puerto Rico. During the event, neighborhoods that have seen hard times become canvasses for artists to create and showcase their work, transforming the area into an open-air gallery. Through the years, the festival has introduced some of the best-known artists to the streets of San Juan. As the popularity of the festival has grown, it has become a major art experience for the community and one of the largest art festivals of its kind in the Caribbean. 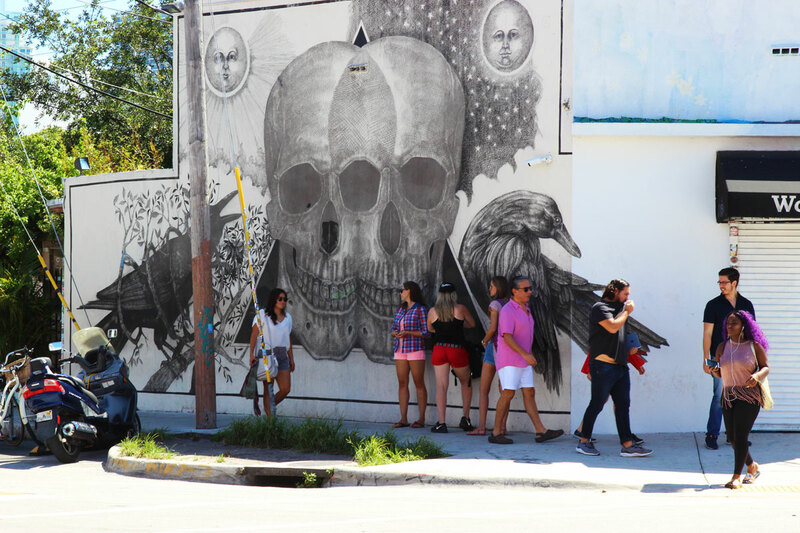 Puerto Rican artist Alexis Diaz has three major pieces in Wynwood. His elephant with octopus tentacles mural in Wynwood Walls shows a unique painting style.